5 years ago, today (Oct 3), I was sitting on the floor at the front door of my university apartment with my computer on my lap. I don’t remember much of that moment, but in a daze of necessary hurry, I dropped everything and opened up my web browser. It was there that I saw the beginning of the change we were going to see in the world. 5 years ago, today, the term “ostomy” was flipped on its head. The widely recognized stereotypical portrayal of an ostomate was disrupted. The repetitive, negative conversation about ostomy surgery shifted. What was once known as a horrible, life-ruining procedure was no more. 5 years ago, today, Uncover Ostomy began. Over the past 5 years, we have all – ostomate or not – come together to change the conversation. We started changing our own perceptions, we started discussing our own stories, and we started sharing to those around us. Through the years, we have made a significant change in what “ostomy” means to the world. Now it’s time for a new partner – one who can help take our experiences, our stories, and our voices to the next level. Today, at our 5 year mark, I am proud to announce that Coloplast has become an official sponsor of Uncover Ostomy. All posts related specifically to Coloplast will have this logo. After years of conversations, months of discussions, and a few weeks of finalizing details, they have joined our efforts in changing the conversation around ostomy surgery. The best part of all? Coloplast is my brand. I have been an avid customers of theirs for over 10 years, completely and 100% on my own. Even after trying out many products from other brands, large and small, I have always gone back to Coloplast, year after year after year, for over a decade. Many of you, whether through a blog post, a Facebook message, or a face-to-face conversation have heard me say time and time again that I cannot talk about the specific ostomy products that I use. This has, thus far, been a calculated decision made by all of those involved in the creation of Uncover Ostomy. Over 5 years ago, as we began putting together this unprecedented campaign full of half-naked pictures baring it all, we had an idea – an idea that we thought could help us fund the conversation changing effort we were building – we were going to ask for the support from one of “the big 3” ostomy companies. The idea was that, whichever of the big three ostomy companies joined us in our efforts of changing the conversation by providing a donation or sponsorship, would have theirs, and only their products, featured in the pictures we were taking for the new campaign. Ie; I was going to wear their product, talk about their product, and show how to use their product. Sadly, after tireless efforts, all 3 companies gave a resounding no. This had never been done before. No one knew what the reaction would be. We had no data to support us. Most of all, no one knew if it would backfire. We also pressed on, undeterred by this unfortunate circumstance, and took pictures using products across the lines of the 3 different ostomy product companies. We built the campaign and have been bootstrapping it, ever since. With very little capital, it’s amazing how far we’ve come. Despite being turned away, we knew that it wasn’t the end of potential sponsorship from one of the big 3. In an effort to keep the door open, we decided that I was not going to discuss the type of ostomy products that I use. This decision was made so that, just in case, an ostomy company did eventually want to sponsor us, I wouldn’t be ruining the opportunity by blurting out my chosen company. But you all wanted to know. So, so, so many of you have sent messages – to me, to the Facebook page, through the blog comments, through the website contact form, through Twitter – that it just didn’t feel right to remain silent. This is such a major element of how I manage my ostomy that I knew I was going to have to open up. However, instead of waiting around for any ostomy company to sponsor our campaign, I decided I needed to go after the ostomy company that I wanted to sponsor us – my brand. It had become abundantly clear that I couldn’t just bring in just any ostomy brand and announce that I used their products. It had to be real. It had to be the truth. So I reached out to the brand that has been my brand for over 10 years. As you’ve noticed – we rarely ask for money. Instead, we focus on asking you to share the campaign, talk positively about yours or the ostomy of someone you know, and we ask that you share. The money, however, needs to come from somewhere else. Coloplast joining on with Uncover Ostomy is the chance we need to take our campaign to the next level. Over the past 5 years, we’ve reached hundreds of thousands of unique visitors online, we’ve had hundreds of thousands of social media impressions, we’ve shared hundred of stories, and changed an unbelievable amount of lives. We are also bursting at the seams, ready to grow. So far, we’ve had very little financial support to even think of expanding into the opportunities that are waiting for us. Before you start worrying about what’s going to happen now, let me be very clear – I have not sold out. Over the course of the many meetings I’ve had with the Coloplast Global, US, and Canadian team members, they made sure that I knew that they didn’t want Uncover Ostomy to change at all. In fact, they were the ones to bring it up to me, before I even had a chance to demand it. Going forward, I am still heading up all Uncover Ostomy efforts, the campaign focus is unchanged, and I am still going to blog (complain) about anything that is relevant to our mission. The partnership with Coloplast focuses on something much greater than what it might seem like, on the surface. Yes, they are providing us money so that I can now talk about their products, but this money allows me to finally open up about the products that I really do use. Furthermore, I will not be talking about/blogging/speaking about any products from the Coloplast line that I do not use saying that I do, and I will not be talking about any products that I do not like. I would never do that, and they don’t want me to, either. In an effort to be fully and completely transparent, I want you to know that any specific Coloplast sponsored post/event/marketing material that we put out will be clearly marked with their logo. You will always know when they are a part of the picture. Simply put, partnering with Coloplast means that we will be able to build upon the mission of Uncover Ostomy. It will allow us to expand our community, highlight your personal stories, and tell the world exactly what ostomy surgery is – life saving. There are so many more ideas that both myself, Uncover Ostomy, and the Coloplast team have already brainstormed that are just waiting for us to do. This is the beginning of a great partnership. A partnership that will help us all. I chose to work with Coloplast because they are my brand. They chose to work with Uncover Ostomy because they believe in us. We are ready to grow. I can see it, I can feel it. It’s time. This milestone is proof of just that. And yes, there is something I wonder about. 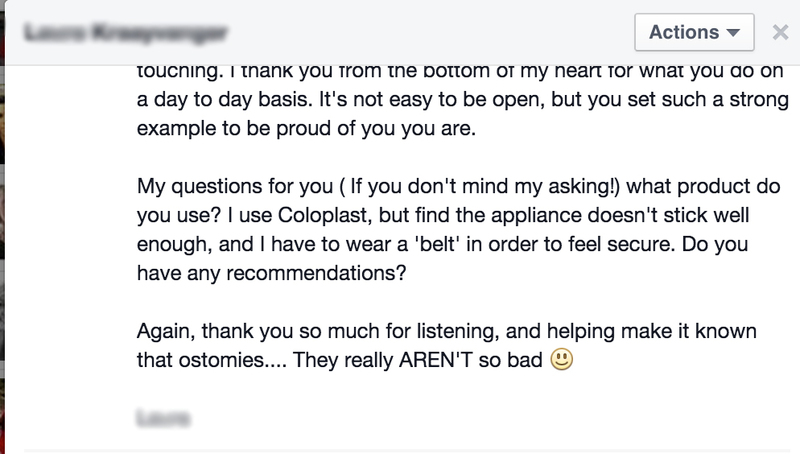 How comes you use colostomy appliances (sensura two piece I guess)? Isn’t it impractical with an ileostomy bag? Don’t you have to swap pouches like five times a day then?